Moroccan sound designer Sara Kaddouri Saturday received the Cairo Film Society Award for her contribution to “Poisonous Roses” movie, a distinction adding on to many she already collected. The Saturday recognition shed a spotlight on the 28-year old woman’s role in Fawzi Saleh’s movie. “I am grateful to all people who believed in me,” Sara Kaddouri said during the award ceremony. “This award crowns many years of hard work in the Egyptian cinema,” she added. Trained in sound engineering in film school “Esav Marrakech” and Brussels-based film school INSAS, where she got a Master’s degree in 2013, Sara Kaddouri settled in Cairo, the capital of the Arab movie industry, for three years. In the Egyptian capital she worked as a sound designer and mixer on few features and documentaries. 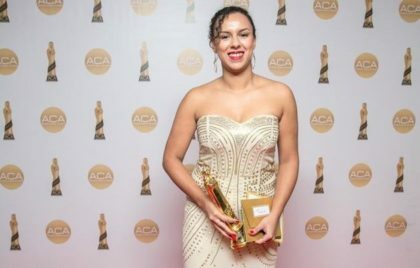 Now based in Casablanca, she seeks “to help independent cinema find its way through the Arab world and make the cinema industry in the region more diverse,” according to her biography written on imbd.com. The young Moroccan woman in October received an award for sound engineering at the 3rd Arabian Cinema Awards for the film “Sheikh Jackson”. In February last year, she clinched an award for “Withered Green” at Egypt’s cinema professional ceremony.